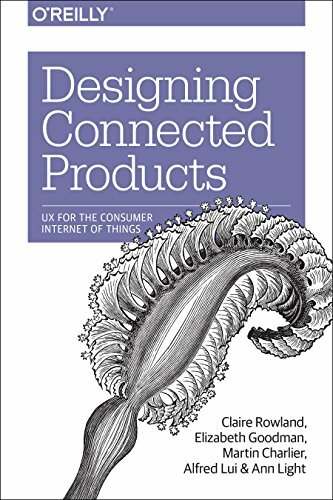 Claire Rowland has a book coming out for US publisher O'Reilly, called "Designing Connected Products - UX design for the consumer internet of things". "The Internet of Things (IoT) promises a wealth of new possibilities for interacting with the world around us. But it is still an immature and technology-driven field, and there are many barriers to creating compelling consumer products. This book explains in simple terms what the challenges are and explores practical solutions for solving them. Drawing on the best of current design practice and academic research, Designing Connected Products provides an introduction to the technology of IoT and practical guidance on designing for diverse devices, cross-device interactions, and complex ecosystems. UX for connected devices is about much more than UI and interaction design. It requires you to think about interusability, industrial design, conceptual models, productization, and platform design. This book provides a clear and practical roadmap for approaching product strategy and design in this novel market, suitable for both UX design and technology experts." The official publication date is March 2015 but it's available on Amazon for pre-order now. For anyone who's interested in starting to read it sooner, there are a bunch of chapters already available to buy as an early release ebook from the publisher's site here: oreilly.com. The early release price includes all subsequent updates and new chapters and the final ebook on publication. This blog was submitted by Claire Rowland. If you would like your work or project featured please email steviemitchell@marchmutual.com.